Woohoo! From today Radio 23 is no longer in beta. Bioig launch party! 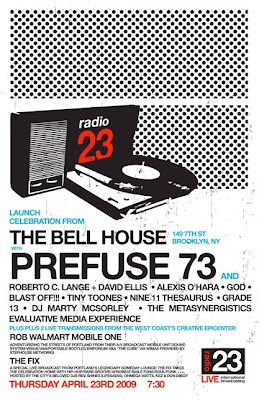 Wish I was in Brroklyn for this. They'll be having fun. I'll be on the road to New Plymouth to see my mum and sister for the weekend, so I won't get to listen. Anyway, I'll be thinking of Jeff in New York and wishing them all the best.